Amending Section 9-213 of The Philadelphia Code, entitled “Farmers’ Markets,” by adding as a permissible location a portion of the sidewalks and curb lanes of both sides of the 3500 block of Ryan Avenue beginning at Frankford Avenue, and making conforming amendments to Section 9-205, entitled “Sidewalk Sales,” all under certain terms and conditions. 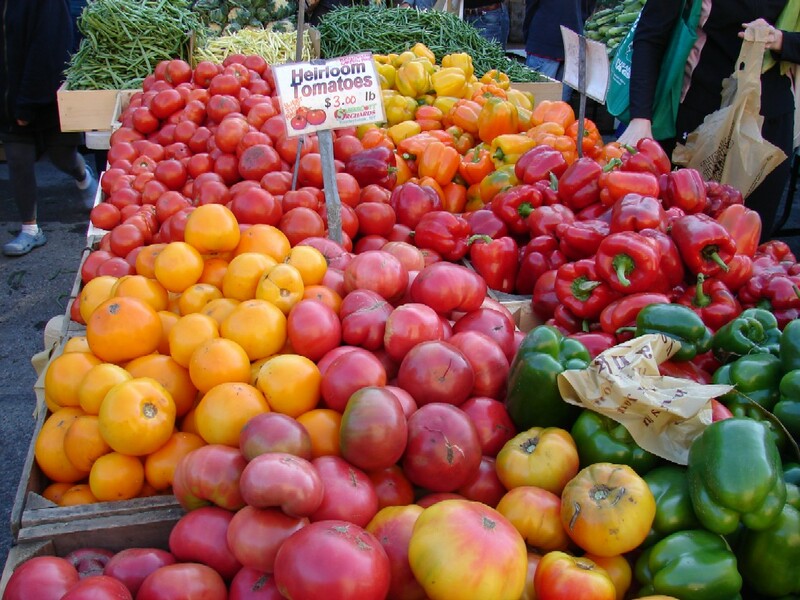 (.b) Farmers’ Markets at locations permitted by Section 9-213( 7 ) of this Code. ( ) The sidewalks and curb lanes of both sides of the 3500 block of Ryan Avenue from Frankford Avenue and extending 156 feet northwest of the northwest line of Frankford Avenue, provided the hours of operation shall be Sundays from 9:30 AM to 3:30 PM, from April 1st through October 31st. As you can see from clicking Here, the Northeast is basically barren when it comes to Farmers' Markets (not including fruit stands and supermarkets) and the northernmost Market is at Bridge and Pratt. Board Members Present: Joseph DeFelice, Mike JP Williams, Pete McDermott, Kevin Leonard, Mike Serverson, Suzann St. Marie, John Jenkins, Lisa Greco, Donny Smith, Milt Martelack, Anna Stacey, Mia Hylan, Melinda Mulvenna. Seargent at Arms Donny Smith stated that applications for membership are still available at the meetings or online at. It is $10 to join the Civic Association for one year. Only paid members are allowed to vote on zoning issues. No by-law updates at this time. Treasurer Kevin Leonard reported that the current balance as of 05/21/12 is $3,833.69. 1. Zoning for 6410 Frankford Ave, Proposed Planet Fitness—Applicant Ronald Patterson, Mayfair Shopping Center. Applicant need a use variance on the property to be used as a fitness center, housing tanning beds and other retail items. 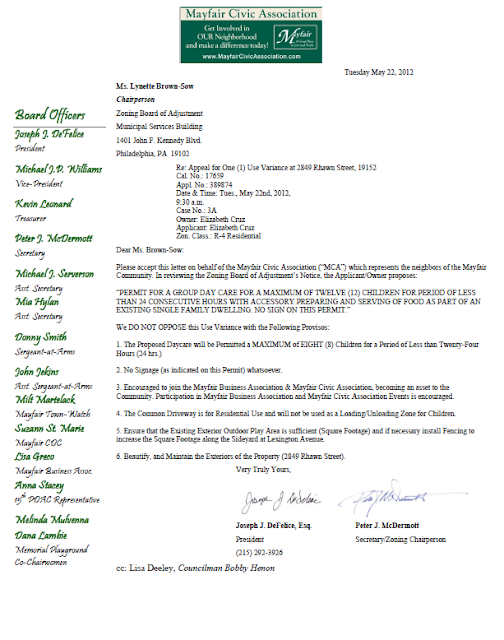 The hearing was originally set for May 30, 2012 but Zoning Chair Pete McDermott was informed that the application had been withdrawn. 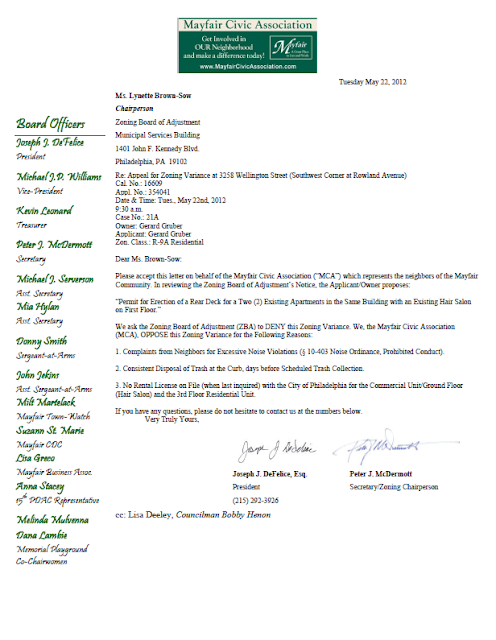 However another notice was received that the date of the hearing has been changed to June 14, 2012. A special hearing will be held when the applicant will present paperwork. No Vote taken at this time. Several statements were made regarding the “predatory” nature of Planet Fitness business practices; Planet Fitness increases memberships by undercutting fees to other members of other gyms such as Bally's and Retro Fitness. Concerns were stated regarding bringing outside contractors from other states and not from within the community. Specific Concerns regarding the alleged us of undocumented workers and illegal workers used in other local building operations in Jenkintown. Also raised were allegations and concerns regarding issues with the ownership of specific Planet Fitness' in Las Vegas and Delaware County. Several neighbors also cited that traffic and parking are already an issue in that shopping center. There was a question regarding Planet Fitness’ Better Business Bureau qualifications. Concerns were raised regarding the competition posed for an existing business (Galaxy Tans) in the Mayfair Shopping Center. In the current tenants agreement there is a stipulation that there would be no type of fitness center unless determined by the owner. Owner has approved the Planet Fitness application and tenants will be allowed to oppose the owner. 2. Zoning for7302 Frankford Ave--Applicant Muhammad Abu Ali. Use variance for a restaurant/cafe with hookah Bar at 7306-7308 (Stutz Candies). Mr. Abu Ali was not present at this meeting. Hearing is scheduled for Wednesday May 23, 2012. Applicant is allegedly having a problem with the landlord/owner “7302 Associates”. No Vote taken at this time. 3. Zoning for 2849 Rhawn Street—Applicant Elizabeth Cruz. Use variance for increasing current group daycare from 4 children to a total of 12 children. Hearing is scheduled for May 22, 2012 at 9:30 am. Ms. Cruz was present with a portfolio of her current business, all supporting paperwork and licenses, pictures of the current day care, architectural plans and elaborated on the process she has gone through. Join the Mayfair Business Association. “Watch Children” signs will be erected along the street. 4. Zoning for 2842 St. Vincent—Applicant ________. Variance for take-out restaurant. Failed to appear before the ZBA. Zoning Chairman and MCA Secretary Pete McDermott was present for the ZBA meeting. Updated Zoning—Methadone Clinic update. The Healing Way Inc.(THW) appealed the denial of their application to the Court of Common Pleas. Oral arguments will have to be heard in front of a judge in common pleas court. This could take up to 6 months in common pleas court. The MCA continues to oppose the application. New Zoning –New zoning codes will take effect August 2012. Neighborhood organizations will have to be registered with the city via an application process with the Philadelphia City Planning Commission. Secretary Pete McDermott is already working on registering the MCA. Two minute presentation from Mike Tomlinson, Republican candidate for the 5th Senatorial District, since he missed the May Candidates meeting due to a miscommunication. Blighted properties/Absentee Landlord properties presentation/information from Mike Fitzpatrick, Mayfair Business Association member from Keller-Williams. Mr. Fitzpatrick requested that neighbors call his office regarding any blighted properties or trouble properties owned by absentee landlords. Mr. Fitzpatrick’s office will contact the owner and give them the option of selling the home to the group of investors. If they accepte the investors will buy the properties. Several concerns were raised by neighbors regarding the new landlords, the possibility of decreasing property values in the area due to these investors buying properties cheaper, and that new landlords are not necessarily from this area. President Joe DeFelice encouraged MCA members and neighbors to use Councilman Bobby Henon’s “Bad Neighbor Initiative” as well as his City Hall smart phone application to report problem properties. Jeffrey Dempsey from Representative Kevin Boyle's office spoke to address concerns that Representative Boyle is trying to “get rid of Mayfair” when the state legislature completes redistricting. Mr. Dempsey clarified that Rep. Boyle wants to “keep Mayfair” and has no plans for leaving. There are also no plans to get rid of the office at 7518 Frankford Ave. Several neighbors addressed concerns with Mr. Dempsey regarding the trash and clean-up around the office and the garbage disposal. Mr. Dempsey assured the neighbors that he will make sure that all garbage from their office is secured however he believes that some of the trash may be coming from other businesses around them as well. Paul from Councilman Henon's stated that the Councilman’s new district office will be opening at 6730 Torresdale Ave. There will also be a Senior Fair held on June 29, 2012 at the Mayfair Community Center. A “Cash for Gold” business tried to open up at 6718 Frankford Ave without proper zoning/usage permits. This issue was addressed by Lisa Deeley from Councilman Henon's office. The owner has taken down all signs but has again applied for a cash for gold license for that storefront. This issue will continue to be addressed by Councilman Henon’s office and the Mayfair Civic Association. Mr. James Ortlieb is the newly appointed chairman of the newly created Clean-up Mayfair Committee. Mr. Ortlieb is proposing a designated one day Mayfair wide clean-up event in the neighborhoods. Mr. Ortlieb will go forward with planning this event by picking a date within the next couple months and exploring city resources for the clean-up. He would also like to focus on areas of Frankford Ave and businesses that do not clean up their storefront areas and sidewalks. Secretary Pete McDermott made a proposal to set us a Community Clean-up at Frankford Ave and Cottman. This was seconded by a board member. There were over 200 runners pre-registered and close to 400 walkers and runners combined the day of the race. Five thousand dollars ($5000) was raised for the Heroes Thrill Show and Two Thousand dollars ($2000) for a Hero Plaque for Joe Konrad. An additional four thousand ($4000) will go towards continued improvements and upkeep for the Mayfair Memorial Playground. A “Badge of Honor” will also be installed at the site of the Mayfair Memorial Playground on which the names of the honorees of the MFHR will be engraved each year. Next year’s honoree for the Mayfair Fallen Heroes Run 2013 will be Officer Chuck Cassidy. NEDP raised approximately $300 at their most recent fundraiser and continues to explore options for land to use for an enclosed dog park in the Northeast. Next certification class is scheduled for May 30th from 7:00-9:00pm at the Mayfair Community Center. Contact www.mayfairtownwatch.org. for more information. President Joe DeFelice, Executive Director Suzann St. Marie and Assistant Secretary Mia Hylan recently met with Councilman Henon and his staff regarding setting up a farmer's market at the Frankford-Cottman Triangle as well as exploring the option of hanging artist’s work in vacant storefronts. Setting up a business improvement district (BID) for the Frankford Ave business corridor is also being explored. There were questions regarding and update on the the landromat being placed on Tyson Ave and Brous Ave. According to Secretary Pete McDermott the ZBA has not granted them their permit yet but the owners did buy the building. Minutes submitted by Assistant Secretary Mia Hylan, 5/22/2012. The Mayfair Civic Association last week came to an agreement with a day care operator, while opposition seems to be mounting toward a proposed fitness center. Elizabeth Cruz, a native of Colombia, is permitted to care for up to four children at her single home at 2849 Rhawn St. in Lexington Park, but she was seeking a zoning variance to increase that total to 12. She’s lived there for seven years. Cruz has passed a child-abuse check by authorities and said she doesn’t drink or smoke. She showed pictures of the inside and outside of her house. She has sealed her fireplace for safety. She said part of her program will be to teach the kids to speak Spanish. Opponents of her bid to expand don’t want a business operating on a residential block and pointed out that the nearby Northeast Community Center offers day care. They also cited the busy intersection at Rhawn Street and Lexington Avenue and what they believe to be a small area for the children to play in outside. “There is no place for those kids to play,” one woman said. Some neighbors worried that children will be dropped off in the common driveway and were generally concerned about traffic and parking issues. Cruz said the youngsters start getting dropped off at 6:15 a.m.
“Most of the people are sleeping,” she said. In the end, Cruz agreed to the civic group’s request to ask the Zoning Board of Adjustment to care for up to eight children, not 12. • Planet Fitness wants to open in a former Fashion Bug store at 6420 Frankford Ave. in the Mayfair Shopping Center. Attorney Ron Patterson explained at the civic group’s March meeting that the 10,000-square-foot gym would be open 24 hours a day. It would include tanning beds. A hearing is scheduled for June 13 in front of the Zoning Board of Adjustment. At last week’s meeting, concerns were raised about traffic, parking and the hours of operation. Neighbors note that there is a Galaxy Tans location in the shopping center. If the center is approved, neighbors want the people hired for construction and permanent jobs to come from the area. Meanwhile, the civic group has concerns about trash outside the Northeast International Supermarket, at 2842 St. Vincent St. The supermarket is seeking a zoning variance to offer takeout food. 1. Record: The Agency listed above is ORDERED to file its record with the Office of the Prothonotary, 2nd Filing Unit, Room 278, City Hall by 06-AUG-2012 or risk sanctions. 2. Motions for Extraordinary Relief: From the dates set forth below in this Order should be electronically filed with Motions Court not later than 04-SEP-2012 any request for continuance should also be filed as a Motion for Extraordinary Relief. Appellant's brief is due by 04-SEP-2012. Appellee's brief is due by 01-OCT-2012. Briefs can be electronically filed or manually filed with the Office of Civil Administration, Room 296, City Hall, and served upon all opponents. 4. Oral Argument: On the legal merits of this appeal will take place on 05-NOV-2012. 1. Complaints from Neighbors for Excessive Noise Violations (§ 10-403 Noise Ordinance, Prohibited Conduct). 2. Consistent Disposal of Trash at the Curb, days before Scheduled Trash Collection. 3. No Rental License on File (when last inquired) with the City of Philadelphia for the Commercial Unit/Ground Floor (Hair Salon) and the 3rd Floor Residential Unit.